You'll be £25.00 closer to your next £10.00 credit when you purchase The Gods of Battle. What's this? Herodotus described the Thracians (who inhabited what is now roughly modern Bulgaria, Romania, the European part of Turkey and northern Greece) as the most numerous nation of all apart from the Indians and said that they would be the most powerful of all nations if they didn't enjoy fighting each other so much. There may have been a million Thracians, divided among as many as 40 tribes. Ancient writers were hard put to it to decide which of the Thracian tribes was the most valiant, and they were employed as mercenaries by all the great Mediterranean civilisations. Thrace had the potential to field huge numbers of troops, and the Greeks and Romans lived in fear of a dark Thracian cloud descending from the north, devastating civilisation in the Balkans. The Thracian way of warfare had a huge influence on Classical Greek and Hellenistic warfare. After Thrace was conquered by the Romans, the Thracians provided a ready source of tough auxiliaries to the Roman army. Chris Webber gives an overview of Thracian history and culture, but focuses predominantly on their warfare and weapons. The latest archaeological finds are used to give the most detailed and accurate picture yet of their arms, armour and costume. He identifies and differentiates the many different tribes, showing that their weapons and tactics varied. The resulting study should be welcomed by anyone interested in the archaeology and history of the region or in classical warfare as a whole. Drawing together historical sources and the latest archaeological evidence, Chris Webber skilfully ressurects these vanished warriors, with particular emphasis in their distinctive armour and weaponry. His comprehensive text, complemented by drawings of friezes and photographs of artefacts, reconstructs tactics and equipment in impressive detail. I was very surprised by the amount of interesting material in the book. I had initially passed on it, as I have no Thracian Army and wasn't planning on one. However, some good reviews and a chance encounter in a bookshop whilst slightly hungover soon persuaded me. There is a very interesting discussion of the development of the Peltast from its Thracian origins - including a worthwhile section on Iphicrates (in all his interpretations) too. All in all, a book with more to offer than the title suggests, and very interesting to read. I was very surprisedby the amount of interesting material in the book. I had initially passed on it, as I have no Thracian army, and wasnt planning on one. However, some good reviews and a chance encounter in a bookshop whilst slightly hung over soon persuaded me. Overall, it's a compact but very thorough reference book. Just one example of how seful it could be to the modeller is that one page shows the known cloack designs taken from various bits of pottery that has been retried from archaeological digs. Whilst it isn't in colour (well, neither was most of the pottery, most of the pieces found so far depict gold/yellow coloured figures on a very dark possibly black background), but takes the form of line drawings, it does give the military figure artist a wealth of ideas if he's about to tackle a Thracian subject. Information like this is a valuable commodity, and with the way in which the book has been compliled it is easy to access, written in a pleasantly readable manner and caters for those dabbling in the subject, but should please anyone who is seeking a greater depth of information. Having read this book, it strikes me as one of those where, if you don't buy it now, in 20 years time you'll be struggling to find it and end up bidding even more on eBay. The author covers the Thracians in detail but, far more importantly, he discusses how they were part of the Hellenic and Hellenistic worlds; looks at their effects on Greek warfare and discusses the evolution of the peltasts and the reforms of Iphikrates. It isn't a book for the beginner, or someone who just wants to paint a couple of bases of Thracian peltasts for a DBA army but if anyone has more than passing interest in Hellenic and Hellenistic warfare, I think this is the book that you want to put on your list of Birthday and Christmas presents. I was so pleased when I read about this book's imminent publication (it has only been released in June 2011, not Feb. 2010 as per the blurb). There are precious few texts out there about the Thracians, the brave, warlike people who lived in the region encompassed by parts of modern day Bulgaria, Romania, Greece, Turkey, Ukraine, Moldova and Macedonia. There's The Thracians, a slender Osprey volume by the same author; Thrace and the Thracians, a dry text by the academic Alexander Fol, and that's about it. In my opinion, this is a "must buy" for those who have longed to know more about Thrace and its people. 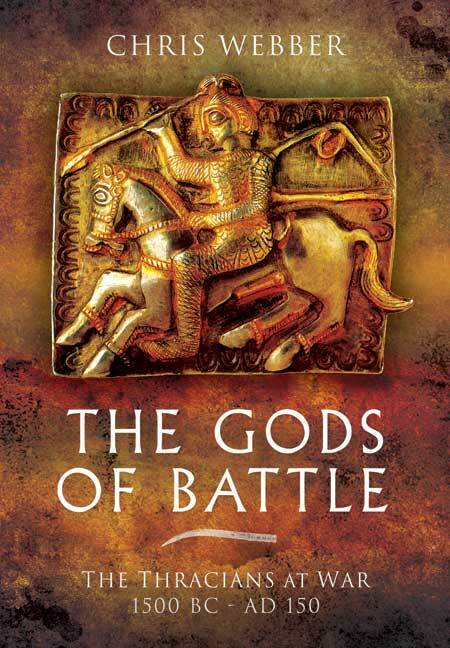 There's a foreword by Fol, and then chapters covering the Thracians' historical outline, their costume, armour, and weapons, as well as military organisation, their fortifications, battles and tactics and a good long chapter on the different tribes. The Thracians' history is covered in detail from deepest antiquity until the time of the wars with Greece and Rome, and their eventual subjugation. There are plentiful colour and black and white plates, maps, and good discussions on such controversial topics as the rhomphaia, the sica, and the falx. The author has spent considerable time writing this volume, and is to be congratulated on a work of excellence. Five solid stars out of five. Christopher Webber has always been interested in military history and wargaming. He studied Ancient History at the University of New England, New South Wales, and Journalism at Charles Sturt University, Bathurst. He has published numerous articles in magazines and military history journals. He has been studying the Thracians for twenty years and has created a huge web site on the subject. He published the article “Odrysian Cavalry Arms, Equipment, and Tactics “in British Archaeology Reports International Series 1139, 2003. He has an MA in Ancient History and is currently working towards his PhD. His first book, The Thracians 700 BC-46 AD (Oxford, 2001), challenged the accepted view of the appearance of Thracian warriors and the type of weapons they used.